After a day of doing relatively nothing yesterday, I followed it up with another of the same. In fact, as I look ahead at the next month or so as I travel down through Laos and into Cambodia, I think there will be alot of days of doing nothing. There’s going to be alot of travel days and the destinations I get to are mostly going to be quiet pit stops on to the handful of “exciting” stops. I am mentally prepared for that so it should be alright, it just makes for a boring blog, that’s all. Anyway, today I slept in and around 10am I was ready for some breakfast. I headed downstairs and, yet again, passed up the offering of bread and jam that the hostel had placed out for us. I asked where I could get a real breakfast and she pointed me to a place a 15 minute walk away. So I walked and walked and sat down in the little westernized cafe. 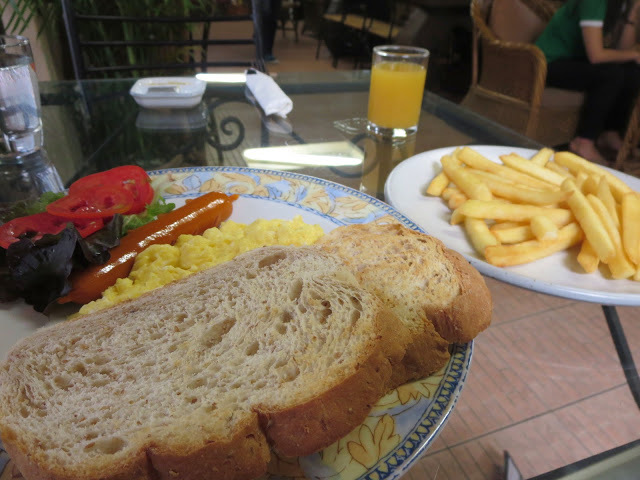 I opted for the scrambled egg, sausage and toast combo for 130 baht ($4.50) and I also ordered a side of fries I saw on the next page for 10 baht (30 cents). French fries in Southeast Asia are their offering for hash browns. 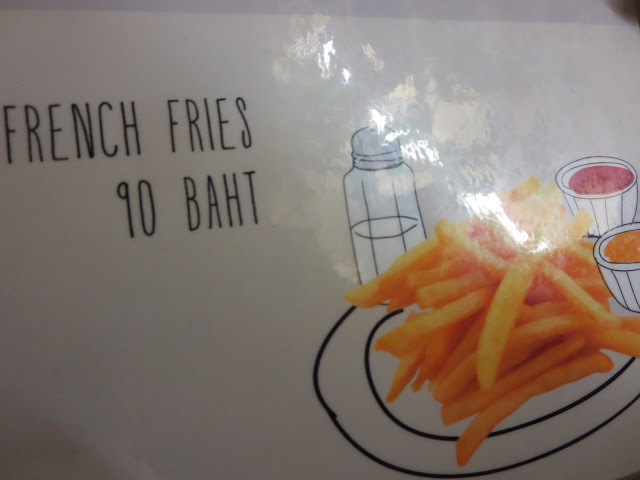 The meal was alright but when I got the bill it had the fries listed at 90 baht ($3). I went and grabbed a menu and that’s when I noticed the little loop on the top of the “1” indicating a “9” instead. Of course if I had known they were that much there’s no way I would have ordered them. How much are the fries? 10 baht or 90 baht? I left kinda pissed because obviously they blatantly made that 90 look like 10. Of course now that I’ve posted the pic and it’s blown up it definitely looks like 90 but at the time I was so sure it was 10. 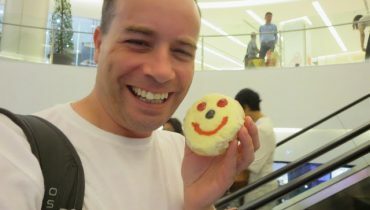 That aside though I will say I have been so happy with the lack of problems when it comes to pricing here in Thailand. I can actually sit down somewhere, order something not knowing how much it is and be charged a reasonable amount. In fact there have been quite a few times where the amount was less than what I would have paid. 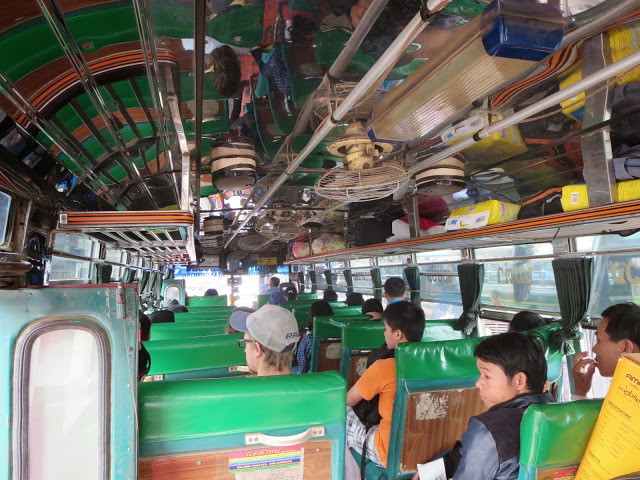 I went back to the hostel and checked out just before 11am and grabbed a tuk tuk for 50 baht ($1.50) to the bus station. 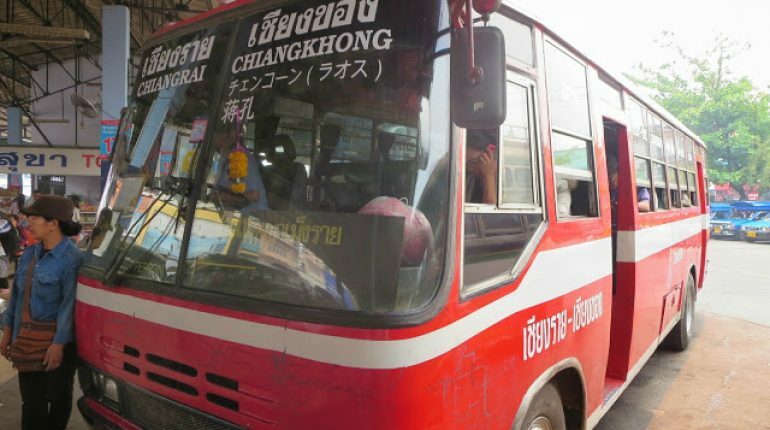 The buses to Chiang Khong leave every half hour on the half hour. I hopped on the first one leaving which was at 11:30am and a few minutes later we were on our way. Although the bus was older and only sat 37 people it was a pretty smooth ride. The lack of air conditioning didn’t really matter as the windows were all open and we got a pretty good breeze as we went along. The ride to Chiang Khong was only 2 hours and we arrived in town around 1:30pm. Before I had left I had checked Google maps to see how far the bus stop was from the guest house I’d be staying at and it looked like it was walking distance. Not with a big backpack on anyway. It was a good kilometer away but I finally made it. Chiang Khong is a small town and the only foreigners here are the ones on they’re way to or back from Laos as the town is literally right on the Mekong River which separates Thailand from Laos. In fact you can actually see Laos from here as the river isn’t that wide here. So, yeah, literally inches away from Laos. Pretty cool. The whole reasoning behind staying one night here instead of going straight over the border was so that I could get some first hand information from people about how I should get from Huay Xai (the border town) to Luang Prabang (the first major city in Laos 500 kilometers away). As I watched all the other foreigners on the bus get off at a stop before mine to head to the border I was regretting my decision. What was I thinking? I should have gone over the border at least and staying Huay Xai. Oh well, the decision was made and I was spending the night here. 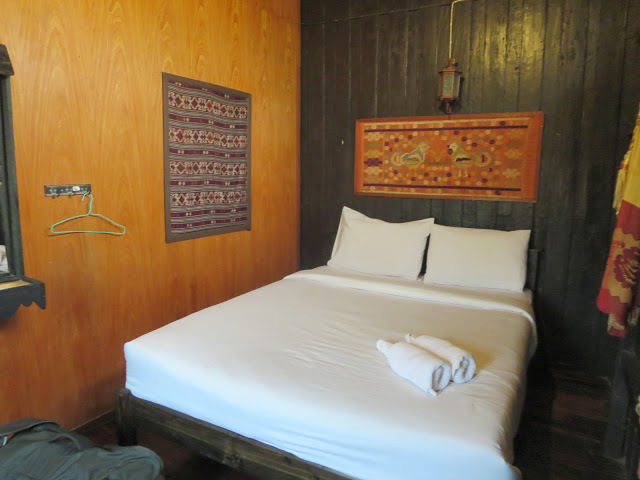 As for first hand information, well, I wasn’t going to get that either as I was staying in a guesthouse and I didn’t bump into any other travelers I could ask. The lady at the front desk wasn’t much help either as in her broken English she tried to steer me towards overpriced packages. Hmmm, looks like I’d have to figure this out on my own. There are basically 3 ways to get to Luang Prabang. The most common way is to take a slow boat where you’re cramped in with 70-100 other people for 8 hours one day, left on an island in a crappy guesthouse for one night and then back on the boat the next day for another 8 hours. The second option is the fast boat which instead of 2 days get you there in just 6 hours. Of course those 6 hours are miserable as you’re squished in with 5 other people in a tiny rowboat turned speed boat with a loud, deafening engine. Oh and everything gets wet and they give you a helmet and life jacket for a reason as they’re prone to crashes. 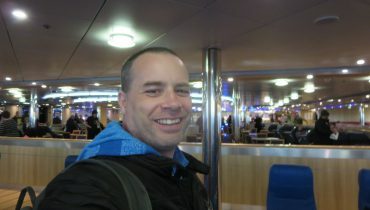 In fact time and time again I came across websites or people who flat out said don’t take the fast boat, it’s dangerous. Which leads me to the third option – travelling by bus. There is an overnight bus that leaves at 5pm and arrives sometime between 3am and 8am. I never could find a definitive answer to how long it took but it’s basically between 10-15 hours. Of course these aren’t sleeper buses so I’ll be sitting upright in a regular bus seat for that amount of time. In the end I opted for the overnight bus which I’ll board tomorrow afternoon. As for how to actually get to the bus terminal in Huay Xai which is just mere minutes across the river, well, that’s another story. Hopefully it all goes according to plan. It’s been really difficult to obtain reliable information on all these things and I’m just crossing my fingers in all works out. After figuring it all out I popped next door for some much earned dinner. 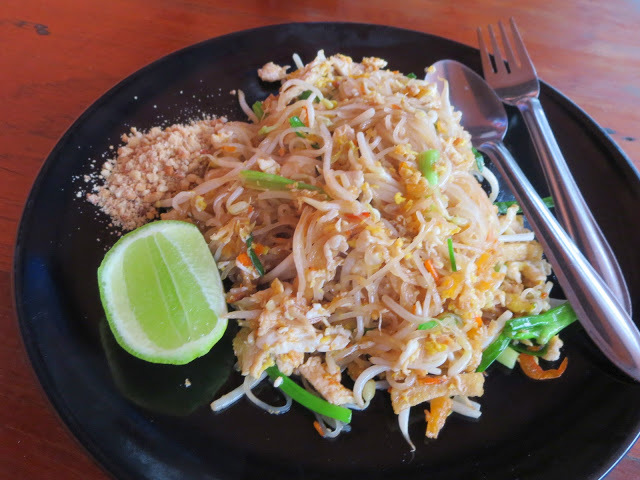 I had a huge portion and had no idea how much it would and was shocked to find it only 35 baht ($1.30) when I would have gladly paid 60 baht for it. I’m actually going to be sad to leave Thailand tomorrow but I can take solace in the fact that I will return to this wonderful country after this upcoming Laos/Cambodia leg.